Does Your Enterprise Have an IT Strategic Plan? Deciding what goes into an IT strategic plan is fairly straightforward, but it takes a little bit of work. The foundation of the strategic plan is the set of enterprise goals and strategies. Enterprise goals generate enterprise-level strategies to accomplish those goals. In turn, the enterprise strategies spawn enterprise-level projects that implement the strategies. In nearly all cases, these projects will have a technology component. The IT strategic plan needs to take the same approach, from goals, to strategies, to projects. The technology component of each project needs to be broken down, so any dependencies can be identified. In addition, there are typically internal IT goals and objectives concerned with internal IT processes and services which should be included. Let’s assume that one enterprise strategy calls for increasing inventory turns by some percent over the next two years. A project that might be derived from that strategy would be providing real-time inventory counts to sales people, so they know exactly what is available when they are at a customer site, enabling them to sell those items immediately. In order to implement that kind of project, you might want to have a more robust communications system, which in-turn may mean adding another communications vendor to ensure that sales people never lose contact with the inventory database. 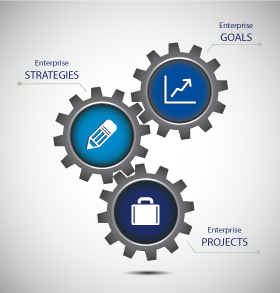 Each project that comes from the enterprise strategies needs to be deeply analyzed. When all of the subcomponents and dependencies have been identified, then you have to take into account the resources (time, people, and money) available to implement the projects. This is where the foundations need to be in place in order to properly set priorities. Each enterprise strategy has a priority, but the company will always have a limited amount of resources to apply toward implementation. If you are lucky, several of the projects will have common technology requirements, allowing those requirements to rise to the top of the priority list since they serve multiple strategies. In any case, enterprise management will need to make a determination where they will receive the best return on investment (ROI) for the resources expended. All of this information comes together in the IT strategic plan, which is integrated with the overarching enterprise strategic plan, ensuring alignment with business goals. If the enterprise strategic plan does not exist, it can be inferred through a conversation with key executives. Once the plan is generated, a set of processes and metrics will need to be established to measure progress toward goals (both enterprise and technology), so that appropriate course corrections occur as projects progress. Upon project completion, there also needs to be a process in place that measures outcomes (i.e. did we meet our success metrics and goals on time, on budget, accomplishing the strategic intent of the project?). While all of this may sound a bit bureaucratic, consider if you don’t know where you’re going and where you’re at on the road, you’ll never know if you actually arrived where you wanted to go in the first place. Occasionally, making the effort to create the IT strategic plan for an organization may uncover opportunities that are not considered in the existing enterprise strategy. For example, technology-driven initiatives that open new markets or create a new technology-based product. This will become more important as information, universal access, and mass customization become key differentiators for business. Technology will increase in importance for all industries and intelligent IT leadership will drive business performance. Does your organization have an IT strategic plan?